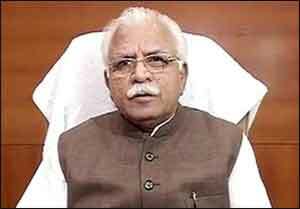 Faridabad: Haryana Chief Minister Manohar Lal Khattar has announced that a hospital would be set up for the treatment of disabled persons on five acres in the state. He made this announcement while addressing the audience after laying the foundation stone of the state-of-the-art Artificial Limb Fittings Centre, a subsidiary of the Artificial Limbs Manufacturing Corporation of India (ALIMCO), to be set up at a cost of Rs 20 crore in Nawada village of this district. The Chief Minister appreciated the efforts made by Union Minister of State for Social Justice and empowerment Krishan Pal Gurjar for the upliftment and welfare of the people and said the credit for setting up of this unit in Nawada went to the Union Minister who presided over the function. Mr Khattar said during the three-and-a-half years of the present government efforts had been made to inject transparency in the working of the government. Schemes have been implemented for the overall development of each section of the society with all schemes under one roof. Delivery of services to the people has been paced up and the system strengthened. For further development and expansion of services at the village level, Atal Sewa Kendras have been set up in villages. The process of setting up more Antodaya centres has been expedited to implement 300 different types of public welfare schemes. The Chief Minister said a sports stadium would be set up in Bukharpur village. Once it met the required criteria, the Government High School, Nawada, would be given the status of Senior Secondary School. He announced the decision to give Rs 11 lakh each for gaushalas in Nawada and Mohna villages though Gram Panchayats, and Rs 5 lakh each for the villages of Bhupani, Rasoolpur Khadar and Mothuka. Speaking on the occasion, Mr Krishan Pal Gurjar said the artificial limb centre to be constructed in Nawada would benefit the entire northern region of the nation. It would be completed within one year.